Communication is an invaluable skill for project managers that plays a key role in project management. Creating good communication channels with stakeholders improves the project’s likehood of success. On the other hand lack of communication is the root cause of conflicts within a project. If you do not create good communication channels between you and your team, they will not take decisions when needed or they will not understand the urgency of the situation. And if you are unaware of how your team is performing, you will not track your project’s progress. This will frustrate your project’s successful completion. Interactive communication, pull communication and push communication methods are used by project managers to improve the quality of work and project’s performance. This article discusses such communication methods. As mentioned above, communication plays a significant role in project management. The Project Manager is responsible for communicating issues related to the project with all the project stakeholders. There are various communication methods such as nonverbal, verbal, written, contextual, oral, body language etc. The success or failure depends on how well you communicate throughout the life cycle of your project. Interactive communication is the most effective type of communication between two or more people in real time. It is a face to face communication type in which the project manager can receive direct feedback from the project team or stakeholders to understand their thoughts and provides them his ideas. Interactive communication can be used when the urgent response is needed or when the issue is important and there is a possibility of misunderstanding. This real time communication method provides fast and effective results. For example you hold a meeting related with the project’s status and invited the stakeholders. During the meeting you discussed key points and bottlenecks of the project and received the participants opinions. This is an example for interactive communication. Interactive communication can be performed via media like teleconferences or face to face contacts. Below are a few examples of interactive communication. Push communication is not a face to face communication type like interactive communication. The project manager sends the information to the recipient with no expectation of receiving the immediate feedback or response. But some action or response is needed when the recipient receives the message. The information conveyed through push communication is usually in written form and should not be urgent classified. In the push communication method, you send the message or information but you are not sure that the message is well understood by the recipient. Therefore push communication method is not suitable for urgent situations. For example in a construction project you detected a dangerous problem related with health and safety. You sent an e mail related with the problem. However nobody read your message and the action is not taken. Pull communication is suitable for large and complex projects with a large audience. In this type of communication, the sender places the information at a general database such as a sharepoint or a share drive and the recipients are responsible to use the information placed at this location. Pull communication is not a face to face communication type and it does not require an immediate feedback or response. For example you subscribed to a website related with PMP Certification Training. You receive information related with the new articles and lessons learned. If you do not read the information or messages this will not effect the website or the website does not expect your response. Interactive communication is a face to face communication type. People involve in the communication and share their ideas in real time. Interactive communication method is suitable when the issue is sensitive and the urgent response is required. 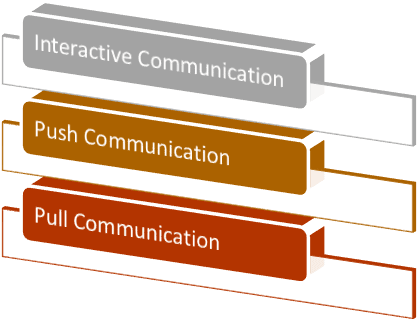 Push communication is a communication type between the sender and the receiver. Therefore it is not a face to face communication type. Push communication method is suitable when the urgent response is not required. However the recipient takes some action on receipt of the message. Pull communication is an informational type of communication. Senders convey the message through websites, bulletins etc. It is the project manager’s responsibility to create good communication channels between all the parties involved in the project. Effective communication makes contribution to any project’ s success. On the other hand insufficient and deceptive information leads wrong decisions and incorrect estimates. Therefore the Project Manager must select the best type of communication method based on the purpose and the urgency of the message or information. Project managers usually prefer Interactive Communication to manage his team and inform stakeholders urgently. Push Communication can be effective if the project manager only want to convey information without any needs to obtain immediate feedback from recipient. When the communication is informational only to the recipients , the pull communication method should be used. If the recipients don’t read it, it will not have any affect on the project.